After Banksy‘s worldwide fame has transformed graffiti and murals from vandalism into real art and even philosophy, the street art scene is exponentially growing, especially throughout Europe. However, for street artists such as Bustart, Banksy is not a reference point anymore. 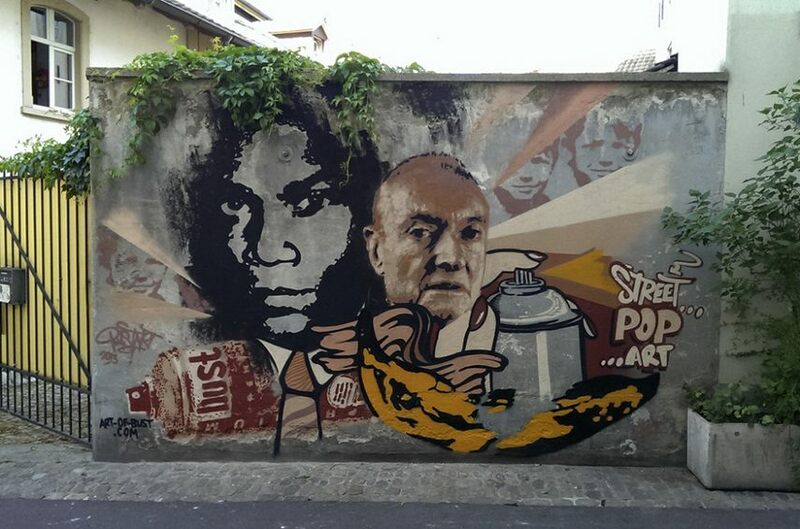 The artist from Basel in Switzerland creates complex stencilling works which look like collages – he’s combining various elements and techniques and uniting them into energetic and vivid murals that are at times provocative, but more often simply visually stunning. Bustart’s goal is to affect people in any way he can, be it on the surface level or deeper when possible. 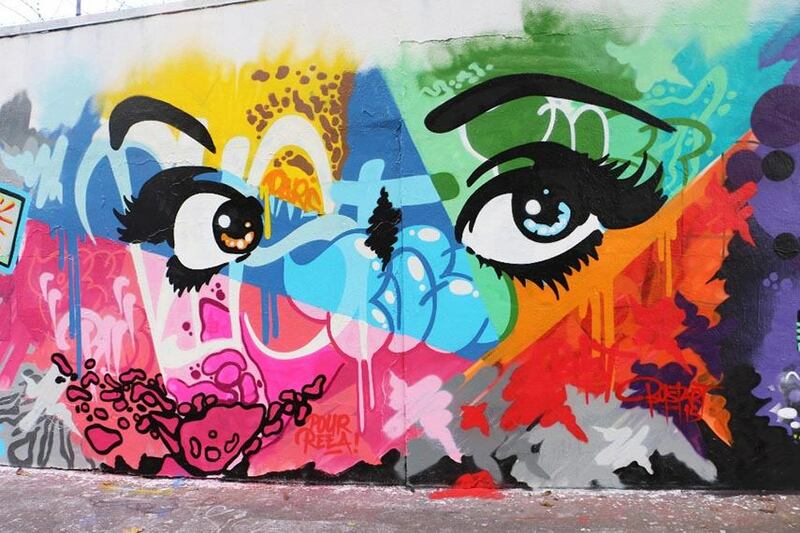 Bustart was born in 1983 and grew up in the times of street art expansion. 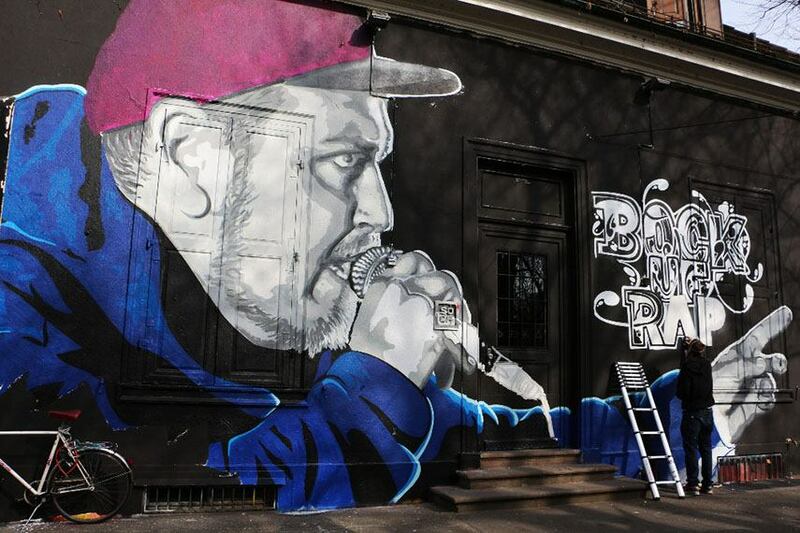 Before he became known for the murals in his hometown Basel, he used to experiment lots with different street art styles and techiques and eventually realized there’s is no point in choosing just one style. Actually, there is no technique Bust doesn’t use in his murals -he paints with a wide range of brushes, markers, aerosols and stencils. Bustart’s work can contain up to eight layers and all of them are done freehandedly. The artist says that his greatest souce of motivation lies in plain gray concrete walls that simply beg to be painted and embellished. In a way, Bustart considers himself a magician whose primary task is to instill life into facades that seem long dead and forever forgotten. Bustart is well-prepared before he starts to paint – he usually spends some time in his studio, processing his visual impressions from the streets and planning on what to do next. Bustart wants to know if his art has a universal effect and the best way to to get to know this is by travelling and experiences different cultures. Being creative as he is, Bustart can work on several different projects at the same time, which means that being a traveling street artist is in line with his energetic personality. So far, he worked in London, Lorach in Germany, Amsterdam and even far away places such as Mumbai in India and Cairo in Egypt. Even though he works alone most of the time, his collaboration with another street artist, Zaira, has been an important milestone in his career. Bustart and Zaira had their work exhibited together in 2014, in GoGallery in Amsterdam. Bustart is invited to several art fairs per year, where he sells his prints and stencilling works made on canvas. The philosophy behind Bustart’s street art is rather simple and effective – he believes that everybody is responsible for making this world better and more beautiful and he uses his visual skills and imagination to make a modest contribution to the aesthetics of the urban world we’re living in. He is especially content when he succeeds in making his audience both enjoy his art and question the issues behind it. His work is rather versatile, it goes from calm and friendly to provocatives and this wide range of motifs in Bustart’s work makes his audience quite diverse as well. The artist is represented by Vroom & Varossieau. Bustart lives and works in Basel, Switzerland. 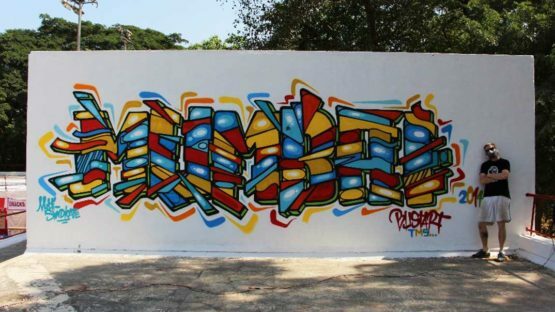 Featured image: Bustart with his artwork in Mumbai, India.